Ambrosia and Iron: April: showers and flowers! 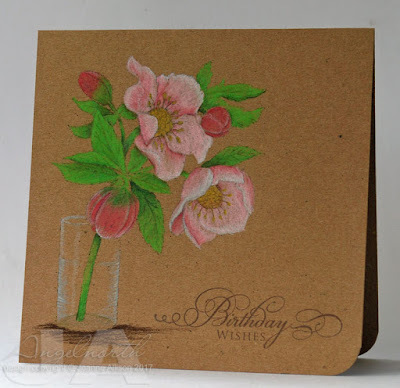 Kathy is setting our challenge over at Daring Cardmakers today and she'd like us to celebrate the season by breaking out the spring flowers! Hellebores are one of the earliest spring flowers and are probably about over by now but I've been eyeing up this image for ages and decided this challenge gave me a good reason to just go ahead and get it! I'm not much of a digital fan in general, I like my crafting to be time away from the computer but every now and again I give in to a lovely image! Since I just printed and then took it to my craft table it didn't feel much different to stamping and colouring in any case. I printed on kraft and accidentally ended up doing "no line colouring" because the toner didn't fuse properly on the cardstock and mostly rubbed off as I worked. I'd done a test print card on ordinary paper first so I had a strong line image to refer to, though. I decided to do a super-simple one layer card and just let the image speak for itself. A beautiful card with stunning colour-work. Great job, love it!